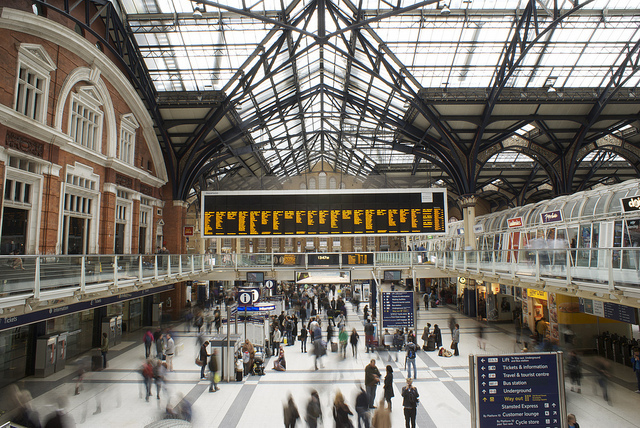 The U.K. announces the single largest investment in rail infrastructure in 150 years. Photo by Ryan T. Watson. Welcome back to TheCityFix Picks, our series highlighting the newsy and noteworthy of the past week. Each Friday, we’ll run down the headlines falling under TheCityFix’s five themes: integrated transport, urban development and accessibility, air quality and climate change, health and road safety, and communications and marketing. The United Kingdom is set to invest more than£9 billion (US$14 billion) in its national railway network, the single largest investment in British rail infrastructure in 150 years. The United States island territory of Guam may merge its public transit network with the Guamanian public school bus system, responsible for transporting 39,000 students to school. A European Union court decision upheld bus lanes in the United Kingdom as holding exclusive right-of-way status, disallowing black cabs from using the lanes for business during transit operating hours. Officials in San Francisco allowed for a study to consider a mileage tax to be levied on private vehicles traveling on public roads, to be used for public transit infrastructure investments. Two Nigerian soldiers were arrested for entering the exclusive right-of-way for Lagos’ bus rapid transit (BRT) system, an act viewed as a statement against the common practice of military personnel abusing their power on city streets. In a move mirroring “game lanes” at the London 2012 Olympics, state officials in Nigeria approved accredited vehicles’ access of Lagos’ bus rapid transit (BRT) lanes for use during the 18th annual Nigerian National Sports Festival. Farmers in the Indian State of Haryana now will have the option of being compensated with developed, commercial or residential plots, as the government uses eminent domain-style land reform to convert farmland into urban and industrial plots. 25 hectares of land dedicated to garbage dumps were integrated into development plans for Kalyan, India, a region outside Mumbai. Local activists launched a fundraising campaign to send air quality-tracking kites into the skies above East Beijing to monitor the city’s infamous emissions levels. The car population in this city of 20 million is on course to exceed 6 million by 2016. In time for the London 2012 olympics, a foot-powered lighting system will guide the way for London Underground passengers in the system’s West Ham Tube station. The amount of foot traffic expected on the walkway is predicted to collect more than 70 million joules of energy, or enough to power 10,000 cell phones for an hour. The Indian state of Maharashta is set to incorporate road safety as a compulsory subject for students, reflecting the high incidence rate of road crashes in India each year. This move for integrated road safety education is the second attempt this year from an Indian state to incorporate road safety into state education. The Union of Concerned Scientists published an infographic demonstrating the link between extreme weather events and climate change, indicating that heat waves and flooding are much more likely than hurricanes or droughts, as a result of anthropogenic climate change.